Mangaluru, Mar 03, 2017: Reports are rife that following the recent arrest of 14 illegal Bangladesh immigrants in Bantwal, the Dakshina Kannada district police have constituted a special team, headed by Additional Superintendent of Police C.B. Vedamurthy, to investigate the possible presence of more immigrants. A team, headed by Bantwal Deputy SP C.R. 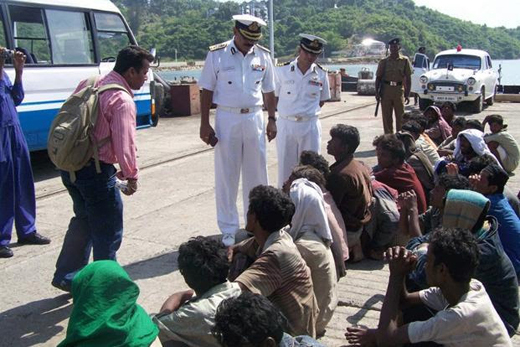 Raveesh, on February 22 arrested the immigrants from a construction site in a village near Belthangady in the district. “It is a matter of serious concern having ramifications on national security,” said SP Bhushan Gulabrao Borase. The Mangaluru city police are also on vigil, while the Commissioner M. Chandra Sekhar said necessary action would be taken to find them and bring them to book. Mr. Borase said the special team would gather ground intelligence to trace illegal immigrants. Action would be taken against persons sheltering illegal immigrants, an offence under the Foreigners Act. Cases would be filed against the labour contractor, who is bound by law not to employ illegal immigrants, he said. Police team headed by Bantwal Deputy SP C.R. Raveesh arrested 14 residents of Rajshahi district of Bangladesh who were working at a construction site in Kashipatna village in Belthangady on February 22. The labourers had managed to sneak into teh country without passport and visa. They were brought in by the local labour contractor Nissar Ahmed, a resident of Moodbidri, to the construction site two months ago. On what security measures are they appointed to work on construction sites?